Shrikand | kesar shrikand, iam trying at home for the first time. I have a very bad experience with Shrikand 2 years back. Once a friend bought me mango shrikand from a shop while visiting me. I have never tasted Shrikand so was so eager and immediately opened it and tasted, after she left. It tasted horrible, i guess the pack must either be spoilt or must not have stored properly in the shop. 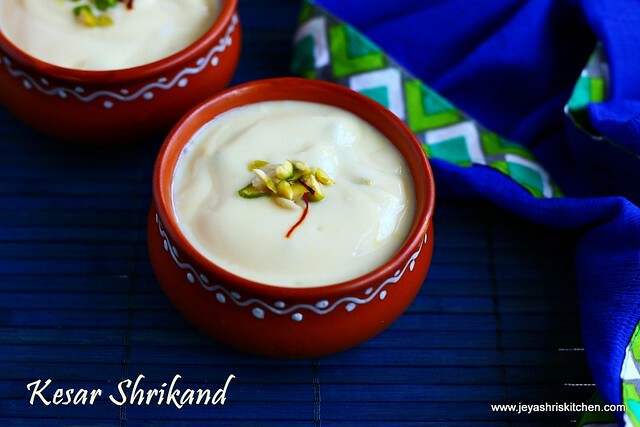 After that whenever i hear the name Shrikand, i will just move away from that place. Recently when i met a friend she was telling that she is a huge fan of shrikand and she makes it home so often for her kids too. 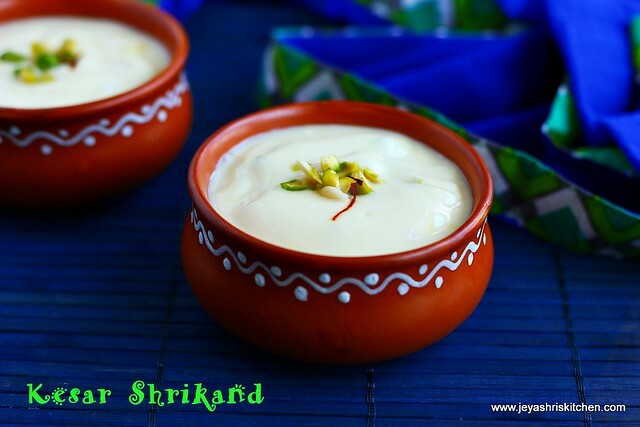 After she telling so much about that, i thought i will try this for janmashtami as curd is one of the main offering for Lord Krishna, Also it is a no cook recipe like vella aval. 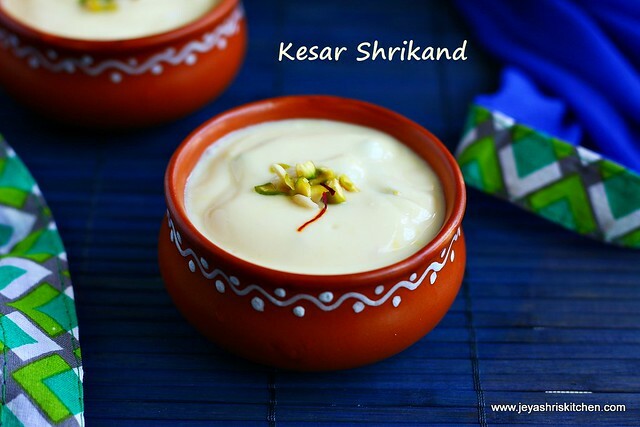 So last minute if you do not have time to cook anything you can prepare this Kesar Shrinkand. Check out my Kesar rabdi and kesar badam peda recipe too. In a big strainer or a muslin cloth put the curd and keep it aside for 3 hours. If keeping in a strainer keep a vessel below this for the water to get collected. I always use this method because the cloth one since we are hanging it outside will make the curd sour. So you will get thick curd after 3 hours. Discard the water. Soak the saffron in warm milk for 5 minutes. Blanch the pistachios and chop them finely. Add the saffron milk , powdered sugar and cardamom powder to the thick yogurt. Mix this gently and well. Do not mix too much as the thick curd will leave out oil. I used the fine sugar and so it get dissolved soon. You can powder the sugar and add too. Add the chopped pistachios. Keep little for garnishing. Adding now will give a nutty texture while eating. Transfer to serving bowls and garnish with pistachios and if needed a strand of saffron. Keep this in the refrigerator for 30 minutes and serve chilled. Do not add soak the saffron in more milk, else it will make the curd loose. Do not over beat this while mixing. You can add blanched and finely chopped almonds too.